Jason Sherman's latest play is a surprisingly straightforward adaptation of the biblical story of Joseph and his brothers. Shifting the setting from Israel and Egypt to Poland and Canada before and during World War II allows Sherman to examine the many guises of anti-Semitism from pogroms and Nazism in the Old World to Canada's unwillingness to accept Jewish refugees though knowing the fate they would face at home. Within these restrictions Dmitry Chepovetsky does his best through expression and gesture to communicate Joseph's state of mind. 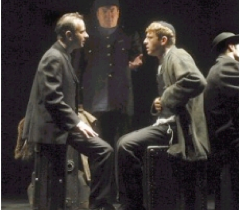 The uniformly strong cast includes Alex Poch-Goldin, outstanding as Joseph's hate-filled brother Judah, and Jerry Franken, chilling as a father who divides his sons into favourites and slaves. Director Richard Rose and set and lighting designer Graeme Thomson have staged the show with brilliant simplicity, using only light and rearranged suitcases and trunks to represent the many locations. Photo: Alon Nashman, Victor Ertmanis and Dmitri Chepovetsky. ©2003 Tarragon Theatre.